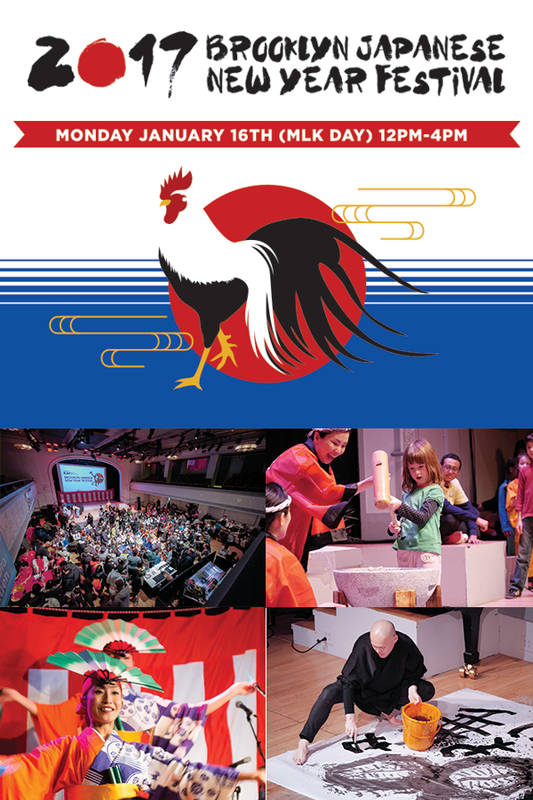 Monday, January 16 (MLK Day) from noon until 4:00 p.m.
Ring in The Year of the Rooster Japanese style in Downtown Brooklyn! The Brooklyn Japanese American Family Association presents a family-friendly program of Japanese food and culture at Roulette. Traditional Japanese New Year’s Dance performance featuring the Shishimai by Minbuza aka The Japanese Folk Dance Institute of New York, Inc.
Cafe Zaiya and ONI SAUCE will power the food court, serving Japanese fried chicken, savory soups, rice balls, gourmet donburi, and Japanese treats. The Roulette bar will be open for those over 21. Families can enjoy making Japanese New Year arts and crafts and calligraphy and playing traditional Japanese folk games such as fukuwarai, koma, and daruma otoshi. #KeNYC, New York’s first kendama team, will teach a street battle-style kendama class. A silent auction benefiting Brooklyn Nihongo Gakuen (Brooklyn Japanese School) will be held on the 2nd floor. Prizes include a selection of Japanese designer purses and bags. Admission is limited, so organizers advise getting advance tickets. To purchase tickets, please visit BJAFA’s website.